Everyone remembers Bryce Sherman, the kid with a lot of talent, speed and heart. The walk on Track & Field stand out and recruit quickly became a fan favorite. Sherman walked on in 2009 after Eric Norwood lobbied Coach Beamer with his highlight tape and urged him to try out for the team. He made it and came in as a WR but finished as a RB but ultimately did most of his damage as a kick returner. That first year he returned 24 kicks, racking up 504 yards while averaging almost 21 yards per return. 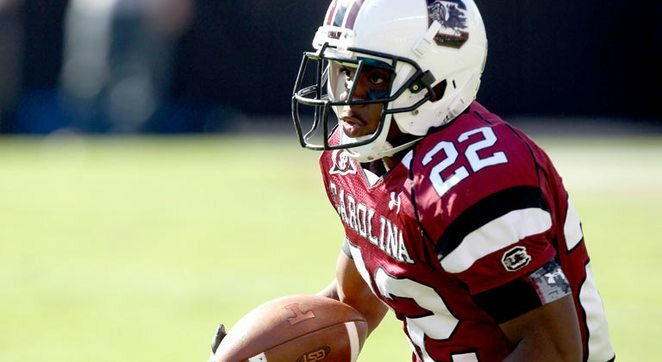 In 2010 he performed even better, starting in every game and returning the ball for over 700 yards while helping the Gamecocks to win the programs first ever SEC East Championship. Not bad for a guy who was listed at 5' 4", 157 lbs with shoes on. While there will always be a lot of controversy and debate about his departure from the program. One thing is for certain, Bryce Sherman walked on at Carolina, proved those who doubted a guy his size could play in the SEC wrong and earned his degree. Bryce Sherman is and always will be a Gamecock. We caught up with Bryce to go On The Block. BCB: Tell us about how difficult it is as a walk on to make it as a part of the team and earn a scholarship. Sherman: "It wasn't too difficult to get on to the team. To earn a scholarship was pretty difficult though, being that Spurrier only gives walk-ons a scholarship their 4th year on the team. So I was very blessed to receive a scholarship." BCB: What is one thing you'll always remember about Coach Spurrier? What life lesson, if any did he leave with you while at South Carolina? Sherman: "He was a very funny person. Life lesson would be to get your education. He always told us, football will end soon, but you will always have your degree. Nobody can take a degree from you." BCB: Do you feel bouncing around from WR to RB and back to WR were efforts to get you on the field and the ball in your hands? Sherman: "To be honest, I don't know. I would like to think that, but when Lattimore came in and showed he was the best guy, it's hard to try to get you the ball there. So when I moved to WR, I felt they were trying to get me on the field, but when I went to the slot, Jason Barnes and Ace were there. They both were better than me at that position. So I wanted to feel that way, but then again, who knows. BCB: How difficult was it handling expectations of track and field and football? Sherman: "In track I held myself to a higher standard, because I was heavily recruited in that and was a State Champion. Coming to college I had big hopes for track. It Didn't go as well as I wanted, but everything happened for a reason. When I went to football, I didn't have any expectations initially. I just wanted to see if I could still play football, and see if I could do it at the collegiate level. After people were doubting me, I then, wanted to show people I could play. After a few days I felt that I could play with them then I set goals for myself, as I wanted to show the players and coaches that a guy my size can play in the SEC." BCB: Coming to South Carolina on a track scholarship, were you approached by the coaching staff or was it strictly your decision to walk on to the football team? Sherman: "It was my decision to go out there. Eric Norwood showed Coach Beamer my highlight tape and he gave him good feedback so I decided to go out there." BCB: Other than being close to home, what lead to your decision to play football again at Winston-Salem State University? Sherman: "The main thing was to get a masters degree in Business Administration. I actually didn't want to play ball anymore, I really went for the education. After sitting out a year. I was introduced to somethings in the business world that I wanted to do, so I kind of left football alone. BCB: What was It like returning kicks at the college level and what was your feeling with the ball in your hands? Sherman: "Really fun.. Opening kickoff of the game everyone hollering and going crazy, so it was pretty fun to be out there and to be on TV." BCB: A little off topic but how do you think you would stack up against Usain Bolt in the 100-meter? BCB: What is one message you would like to give all of Gamecock Nation? Sherman: "Thanks for all the love and support. I still cheer and pull for them in all sports. I'm proud to be a South Carolina Alum. And... Yes, I did graduate from there the following summer of 2012."